The importance of the site lies in several areas. First, unlike nearly all excavated or surveyed urban or fortified centres of the Hellenistic, Roman and Byzantine periods – 6th – 11th centuries – Euchaita was never a major metropolis, cultural centre or extensive urban site. In contrast, it was a small, if at times strategically significant, provincial town, something of a backwater for much of its history. In this respect, therefore, it is much more typical of the ‘average’ urban or fortified centre of Asia Minor , yet we know almost nothing about such sites because none has yet been excavated with a view to following such long-term changes. 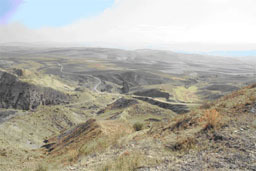 Archaeologists have concentrated, for a range of reasons, on major ports and cities whose history is relatively well-known at least in their broad outlines – Ephesos, Amastris, Pergamon, Ankara, Amorion – whereas sites such as Euchaita, which are no longer occupied and thus offer superb possibilities for excavation, have been ignored. A full survey of the site and its wider environs is possible, therefore, with minimal disturbance to local populations and minimal complications from later settlement. It offers a unique opportunity to research the history of a late Roman town from its foundation as such under Anastasius between 515 and 518 CE, along with the small fortress which grew up on the hill behind it after the middle of the seventh century. It was a typical fortified semi-urban site, which formed an important element in the network of urban centres of the middle Byzantine world, a significant part of the defences along the eastern frontier of the Byzantine empire in the medieval period, one which represented the ‘norm’ of provincial fortified sites; as well as a typical rural province within the Ottoman empire right up to the 20th century. It also offers an outstanding opportunity to establish an environmental and landscape history of the region and relate this directly to the pattern of human activity across several millennia. The development of computer technologies that permit the manipulation and visualisation of complex, spatially referenced geographic and mathematical data in complex situations makes a much more detailed and functionally-useful account of the survey area possible. GISs, virtual reality modelling and a variety of visual technologies are at the forefront of this development, and make the complex modelling of the effects of human behaviour on landscapes and the environment an attainable target. 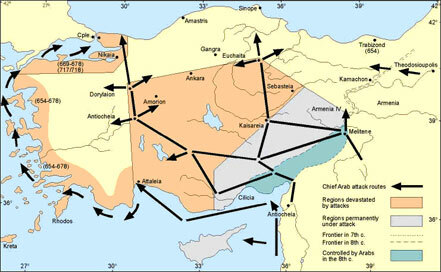 Second, the history of Euchaita/Avkat is not undocumented in written sources. A collection of medieval miracles of the later seventh or eighth centuries CE offers important information about life in such a fortress at that time; the letters of its bishop, John Mauropous, who held the see in the eleventh century, describe many aspects of life in the town; while Ottoman documents provide information about the local population, their tax-status and occupations, from the 16th century onwards. There is in addition a good deal of incidental material in chronicles of both Byzantine and Islamic origin, as well as epigraphic and sigillographic material, especially with regard to its ecclesiastical history. 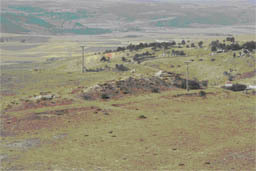 Travellers of the Ottoman period, and European visitors, have also left reports or comments on the site or its district. Third, its role as a military base, situated as it was near an important military road in Byzantine times, together with the opportunity to conduct a detailed paleoenvironmental survey of the region around it, to reconstruct its medieval landscape, and to relate the archaeological and palynological (pollen analysis) evidence for land-use and food-production during the ancient, medieval and early modern periods, makes it a perfect focus for the detailed surveys of specific catchment areas required by the Medieval Logistics Project. 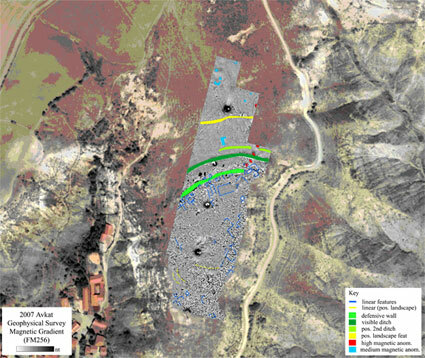 Kale Tepe: satellite image with geophysics results superposed. The location of the assumed medieval defensive works can clearly be seen. Preliminary geophysics survey results from summer 2007. Finally, Avkat in the Ottoman period was a small village typical of the Asia Minor hinterland of the empire, and in comparison with many larger and more substantial centres, both commercially as well as in terms of local industry, offers a useful opportunity to study such a rural settlement in its larger historical context.